Elise and Brandon wed at the beautiful Highland Manor in Apopka, Florida. This 1903 Mansion just off Hwy 441 makes for incredible backdrop for any wedding. Because the weather in January can be unpredictable the couple decided to go ahead and plan for the ceremony inside the ballroom and then with the staff at Dubsdred Catering, the room would be flipped during cocktail hour, to become their reception venue. It all went off without a hitch. Flowers by Lesley decorated a beautiful infinity arch from Orlando Wedding and Party Rentals, created centerpieces for each table, and made the stunning bouquets and boutonnieres for the couple. 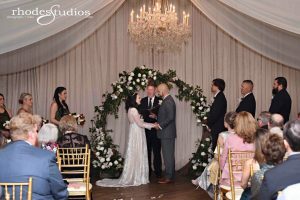 Rhodes Studios Photography and Videography captured every moment of the wedding day; from getting ready pictures, through the ceremony and into the night as their guests danced the night away. Justin with the Orlando DJ Group took care of the ceremony music and kept the dance floor hot all night long. Their custom ceremony was created by Rev.Glynn Ferguson from Sensational Ceremonies. They chose a simple traditional Christian ceremony and Rev.Glynn had them write and say why they love each other. Just like Christ has chosen us in Him, so has He chosen you for me. With our first meeting and chance at love; I let you slip away. Since that day I always wondered if you were that “what if” person. Little did I know 10 years would pass and God would bring you back into my life; to be my only person! “You are the only one that I want, and the last thing that I could ever have.” I thank God every day for his grace and for Him; bringing you into my life. I promise to love you, loving God for the rest of our lives! Elise wrote: I can’t say that it was love at first sight inside a Tijuana Flats when I was 18 as I served you tacos, but what 18 year old me would never believe is that you would end up being my forever. I love you even more then that girl thought was possible. You found me again when I had given up on ever understanding real love. I love you because you showed me that I was worthy and made me believe in myself again. You have given me strength in myself, picked me up when I struggled, and shown me what it really means to be someone’s partner. I truly believe that God created you for me. I love you forever and always. We wish them happiness for a lifetime as they walk the road of life together.